Get into the college of your dreams! Learn the tricks to get an 800 on the math portion of the SAT by using this powerful study program. 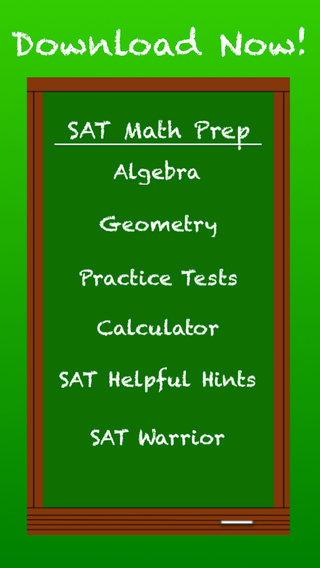 The more math questions you complete, the more items you unlock for your SAT Warrior! Use this incentive to practice more problems to earn the best items and pets for your Warrior! Practice specifically Algebra and Geometry and take a multitude of practice tests categorized as easy, medium, and hard practice tests! Every question has its own workspace so that you don’t even need a pencil while you work out the problem. Between this feature and the in-app calculator, all you need is this app to become a mathematical genius. If you get stuck on a problem, a walk-through solution and hint is available for every question! Also, use the skip button if you’re crunched for time and need to come back to it! SAT tips are also provided so you can excel on every portion of the SAT test! Study break options are also available! Reach your full potential. Download now.